A refreshing update to enjoy for decades to come. 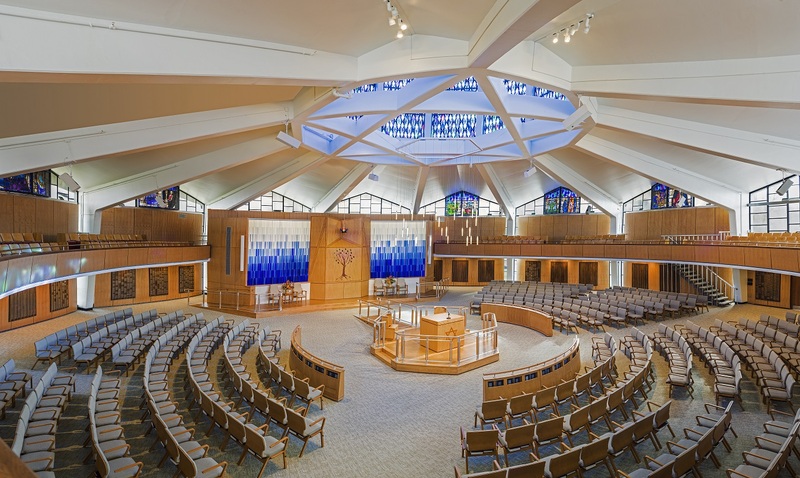 Becker & Frondorf oversaw three phases of renovations at Temple Adath Isreal, beginning with the evaluation of a Masterplan. The first phase required replacing the 60,000-square-foot roof of the entire building complex, and the second phase involved supervising the extensive major repairs to the Chapel. The third phase included a full renovation of the Sanctuary, completely transforming the existing structure into an open, airy and striking grand rotunda. The project included the construction of a moveable Bimah, the creation and installation of a custom glass art work created by artist Paul Housberg, Surrounding the Ark, and a new Ner Tamid. Additionally, we oversaw a Facilities Assessment to help the Synagogue plan for their long-term facilities’ needs.